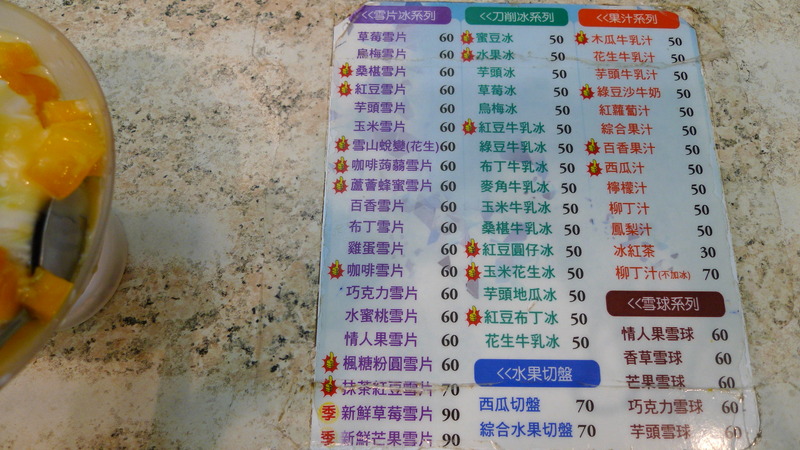 <300NT, 5 hearts, dessert, dessert., jiantan (劍潭), night markets., shilin night market (士林i夜市), taiwanese, vegetarian. One of the things about keeping a food blog is that you become the food guide to all your friends. One thing that my friends visiting from the States always ask me about is shaved ice, more specifically “snowflake ice” or milk ice (雪花冰). 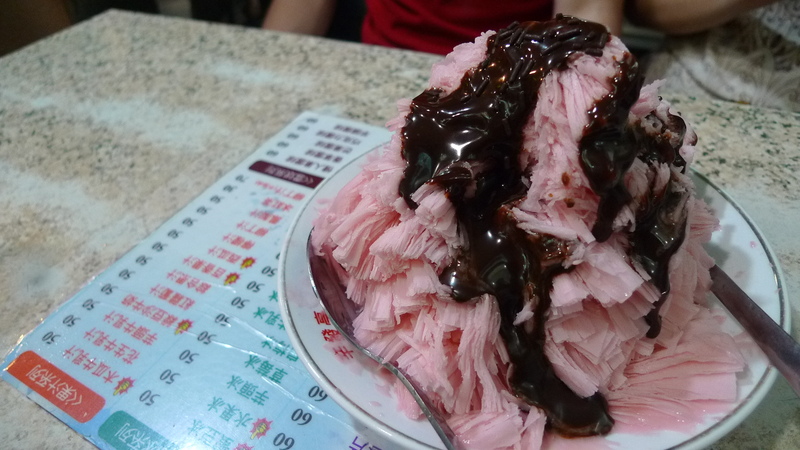 One of the most famous places in Taipei for this type of shaved ice is probably S.F.T. Juice & Ice (辛發亭冰品名店) at the famous Shilin Night Market (士林夜市). According to my friend, this store claims to have invented “snowflake ice” aka xue hua bing. They proudly boast on their banner that their shop has been around for 46 years. Whether or not they actual did invent “snowflake ice”, who knows. What I do know is that their “snowflake ice” is delicious! Note that directly across from S.F.T. Juice & Ice is another shaved ice shop. Their banner is green. When we last went it looks like they might have finally closed shop. Basically no one was ever in there. Even if there was a huge line at S.F.T. and the other place was empty, people would wait at S.F.T. Just watch out for that. The inside of S.F.T. Juice & Ice it pretty compact. Lots of tables jammed pretty closely together. There is almost always a wait to be seated, but the turn over is pretty quick so you shouldn’t have to wait more than 15 minutes for a seat. 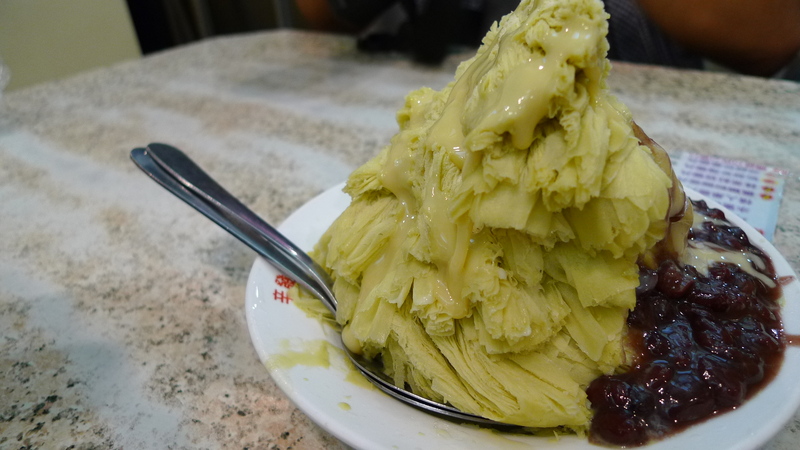 Of all the flavors I think my favorite is the Green Tea Snow Ice with Red Bean (抹茶紅豆雪片) for 70NT. The ice tastes like creamy green tea. It’s not too sweet, and still has a little of the bitter tea taste. Condensed milk is drizzled over the top and red bean is served on the side. So good. I was really surprised to find that they still had fresh mango at the end of November. The snow ice with fresh mango and fresh strawberries are seasonal, so I’m used to the mango being out. Anyways, it was a good surprise. 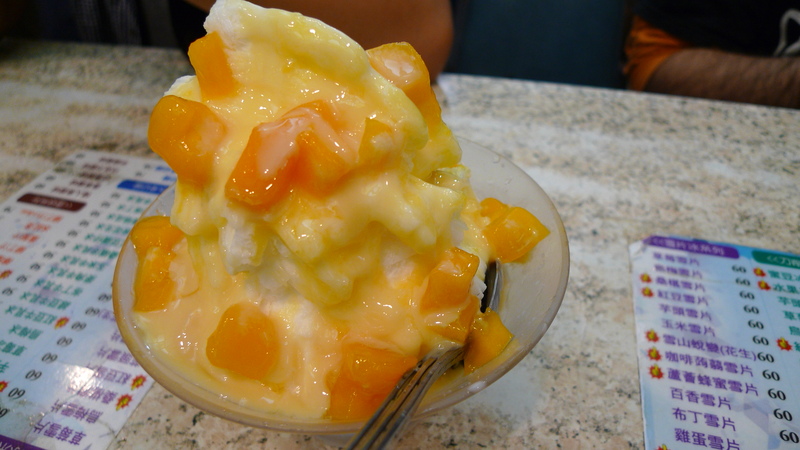 The two out-of-town friends (first time to Taiwan) both loved the Snow Ice with Fresh Mango (新鮮芒果雪片) for 90NT. The milk ice is served with fresh mango chunks and condensed milk. This was gone in about 2 minutes. 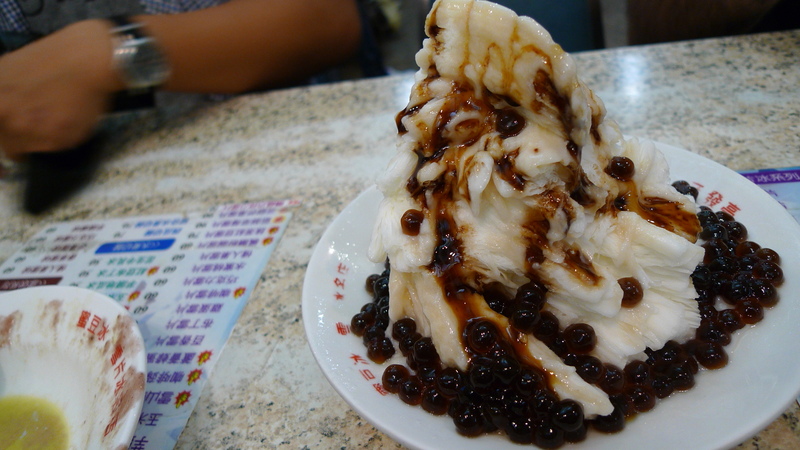 Our visitors wanted more, so we got the Snow Ice with Maple Syrup and Tapioca (楓糖粉圓滿雪片) for 60NT. This was pretty tasty, too; probably the sweetest of the ones we got. Overall, S.F.T. 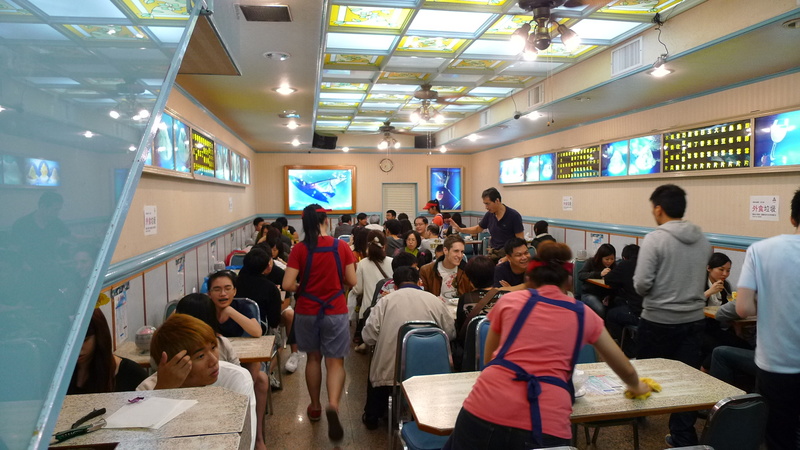 is a great place for shaved ice, and maybe even the originator of “snowflake ice”. 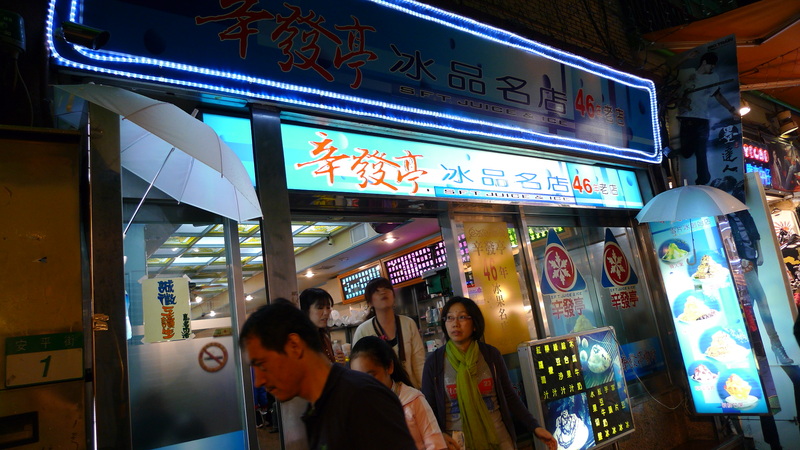 So, if you’re in the Shilin Night Market area or looking for some tasty shaved ice, give it a go.